The American colonies were quickly developing a national identity. 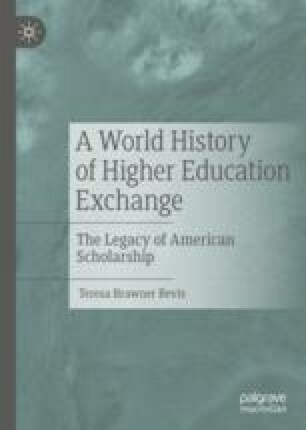 Well before their independence, they sought to establish institutions of higher learning that could serve local communities, thereby eliminating the need for youth to seek advanced scholarship in the universities of Europe. The chartering of America’s first colleges, beginning with Harvard in 1636, was a first step toward building academic centers that could someday compete with those of England or France. College-building escalated after the country won its independence. Between 1782 and 1802, 19 colleges were chartered, more than twice as many as had been founded in the previous 150 years. Curricular reform, given impetus by Jeremiah Day’s 1828 Yale Report, brought the sciences to the forefront of the nation’s course offerings, transforming Yale and other institutions into exciting hubs of discovery. By the mid-1800s, many internationally mobile students and scholars were turning their attention to the United States.